Holodance is a Virtual Reality rhythm game that is currently being developed by narayana games. Its build-in music is composed and produced specifically for this VR experience using binaural audio. Holodance also supports loading osu! beatmaps which gives players access to almost 12,000 perfectly beatmapped songs, some with varying difficulties for an overall 45,000+ beatmaps. The 14+ environments you can play in are designed to perfectly match the sound to give you: A spatial, rhythmic, audio-visual experience of pure ecstatic joy! 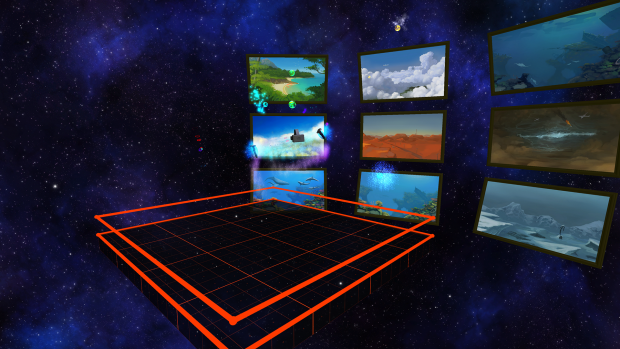 Think of Holodance as a music video that you can enter and play with. But it's not just a 2D video - it's an actual reality that touches hearing and seeing and hopefully your heart! The game has both a free-mode (just a pure rhythm game) and a story-mode (in development) where a group of dragons returns to planet Earth to find out: Are you ready to write a new history for the future? This is a sequence of the whole demo of Holodance Episode 1: Dancing with Dragons, taken at Alpha 33 (this is pretty much what we've demoed at the last Virtual Reality Meetup in Munich and Virtual Reality Day at Hochschule Fresenius, Munich in December 2015.